..so true! Marriage is one of the most important and life-changing milestone for a woman. It is that time of one’s life when they are showered with blessings, advice, happiness, and gifts. Everyone who visits the bride has something to offer her for this new beauty in her life, isn’t it? From amongst the best of gifts like exquisite dresses, bling accessories, gift cards, fragrant flowers and others, I believe Watches are one of the most thought-after gifts for a bride in many ways. We agree that now with Technology, the value of a wrist-entangled timer is seldom needed, but the beauty of premium and branded watches are unmatched. They add a subtle glow to the vivacious radiance of the bride and it also suggests or implies how much one values time and also gifts her with one, making her understand the value of time and using it to the optimum. The very first rule while buying ladies watches is that it must be branded and very sophisticated in its presence and feel. Next, it should look royal and elegant. It’s my D-Day soon this year end and I had been through a number of stores and websites to boil down to some finest collection or trends of bridal or ladies’ watches that one must consider gifting this year. Mind you, these need not be necessarily limited to Brides but to any girl who has their birthday or anniversary, any special accomplishment or even occasions and festivals for that matter. I believe no color could match the beauty of the color White. It is pristine, radiant, sophisticated and casts a great impression at first glance. 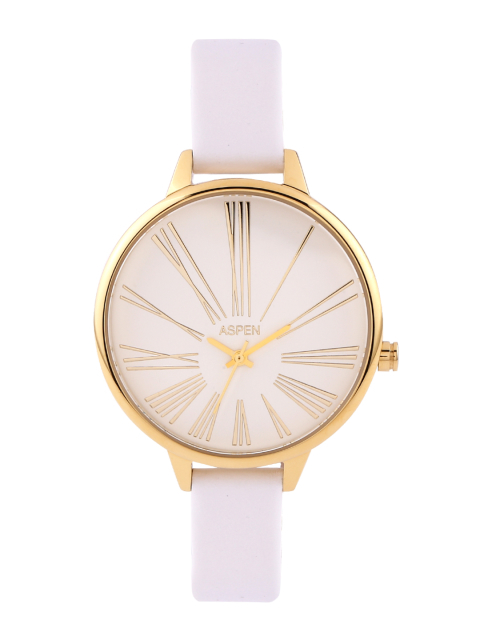 This meticulously designed white watch with fine rose gold details by ASPEN is the perfect find for women who love enamor. We all know that diamonds are the best friends of a woman! Ok, we missed the Swarovski there! 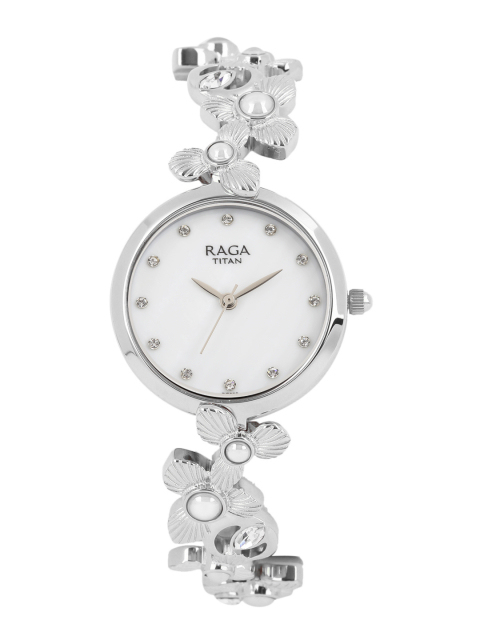 This amazing Titan Raga analog watch embellished Swarovski is the best to gift on birthdays and bridal occasions. You gift it once and be remembered for a lifetime. The next best addition to this trend is the sleek and classy timepiece like this cream colored analog watch with 3 different bracelet designs by Anne Klein. Women simply adore delicate bracelets and this piece completely does justice to that notion. One can change the strap depending on their mood and all of them are equally desirable. This color trend is one of the most successful so far. It is my personal favorite too. No girl will say no to this shade. 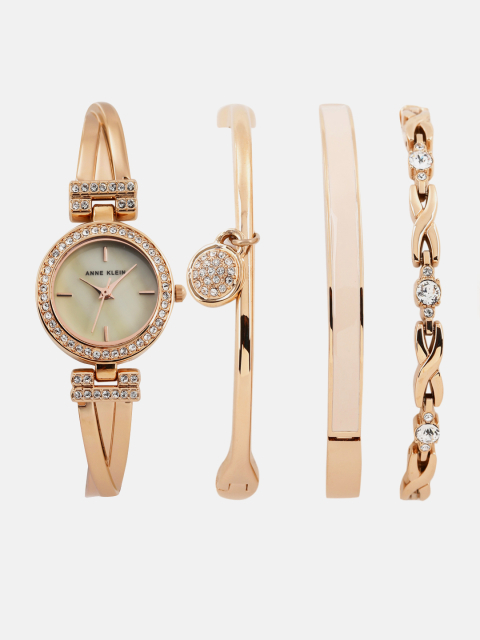 It’s timeless and so feminine. 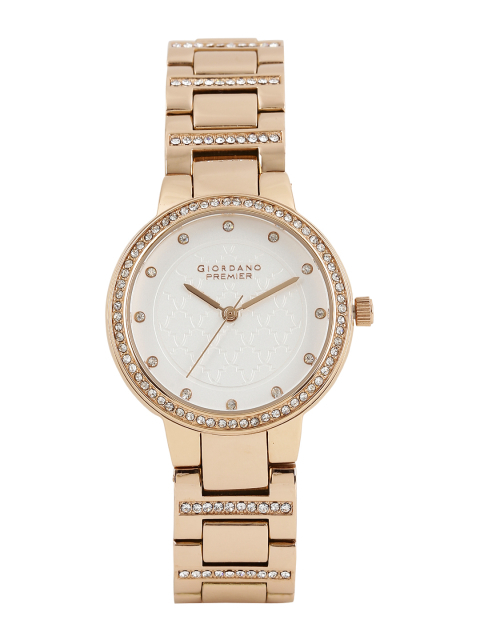 One of my favorite picks is this eternal rose gold premier women’s watch by Giordano. You won’t regret buying this. …in a positive way! Blue is a very blissful shade for women. Apart from the grays and golds and whites, something which calls for a trendy color in terms of occasions, Blue is the one. 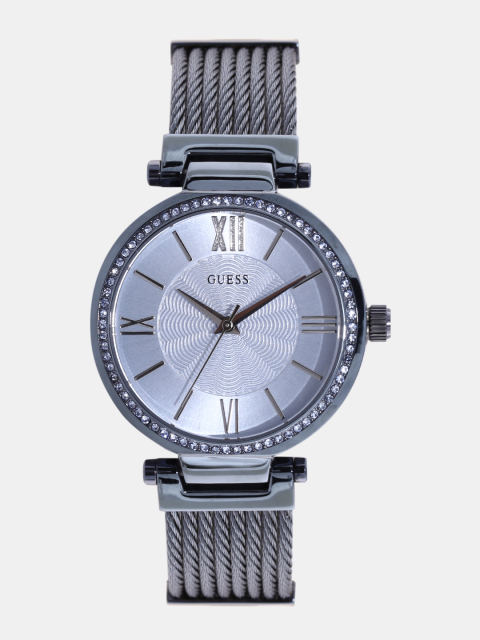 This ethereal blue timepiece by GUESS is a must buy. Ivory shaded watches are indeed magical and radiate optimism and beauty. 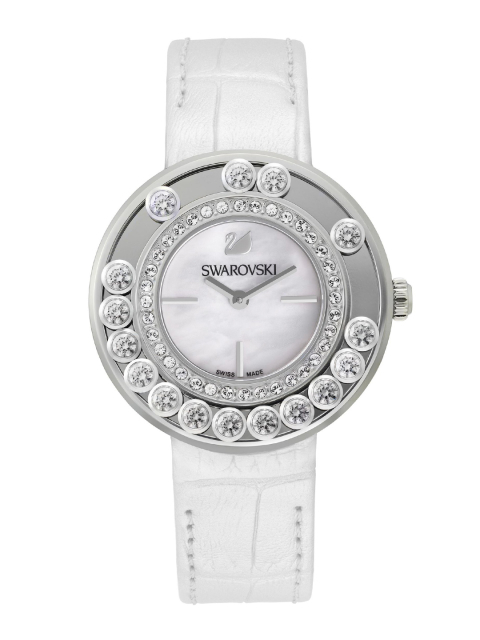 One such classic find is this lovely ivory watch studded with lovely crystals around the dial by Swarovski. this is the last in the watch trends 2017. No one can deny the beauty of a sparkling silver wrist watch. I completely adore this material and color. 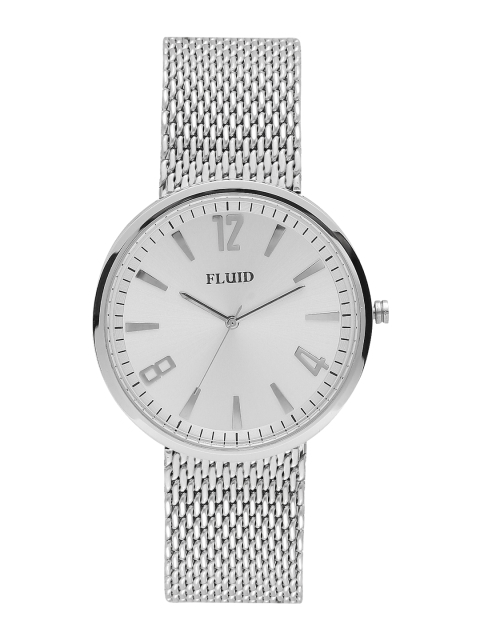 One of my best picks is this stunning silver analog watch by Fluid which calls for a celebration. What is your favorite amongst these? What do you think should be the ideal gift for celebrating a woman? Share your thoughts and ideas in the comment section. I have worn atleast 10 watches in white strap.. I just love how classy they look. Thanks for the awesome Compilation. Whenever i think about any gifting idea watch is the first name that comes to my mind. It is just perfect for gifting to any age of person or gender. You shows many great designs of watches. White one is very beautiful among all. And gold one also looks very stylish one. You listed above some very unique designs of watches. I like this amazing compilation. Love the first line of your post.. Never heard about this brand but designs are super pretty.. I am a wrist watch addict. I have to include wrist watch with white strap. It looks really classy. Thanks for sharing. Btw, I love fossil and raga. This has just came on the right time, it’s my birthday month and I have been looking out for a beautiful watch – I love the rose gold and simple bold dials. Lovely ideas and thanks for sharing with us. Previous Previous post: Participate now on Auto Portal this Independence day to win BIG!